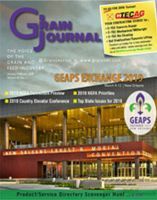 Horizontal fall arrest systems are commonly used in the grain industry. 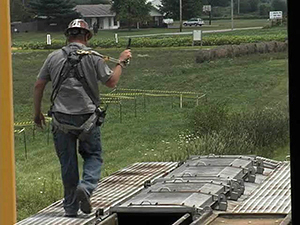 If used properly, these systems can prevent workers from falling not only off the railcar, but also into the railcar. 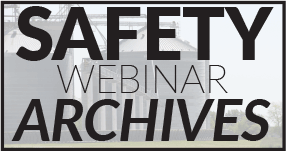 Remember the key points when using a railcar fall protection system. Inspect self-retracting lifelines (SRL), lanyards, and harnesses prior to each use. Always return the lifeline to its housing when not in use. Storing the unit with the lifeline out of the housing can cause the retraction springs to fatigue. Always attach the SRL to the back D-ring of the harness prior to climbing ladders or using gangways to access the top of railcars. Once on top of the car, use the "tug and walk" technique. Grab the cable just above the snap hook and give it a firm tug. Maintain tension on the cable when walking on the tops of railcars. This will ensure that the braking mechanism remains engaged. This allows a worker to maintain balance while moving on top of the car. Never walk more than five feet from the overhead connection at any time. The will eliminate swing fall hazards. Avoid jumping from a railcar ladder or bending over too quickly. This will cause the SRL to lock. Moving slowly back into an upright position will release the braking mechanism.